Populate Your Island with Mystical Dragons in this Fantasy Tycoon Game! Do you know what people would pay money to see these days? How about dragons? Not those huge fire-breathers that hoard treasures, kidnap princesses, and eat knights for breakfast, but smaller, cuter and more benign little guys that feast on sugary treats and are aligned to different magical elements. 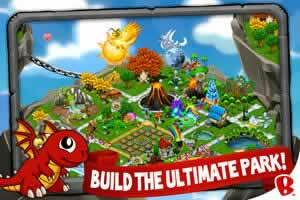 That is what you should expect to deal with in DragonVale, a little fantasy tycoon game that you can play anywhere at any time on your iPod Touch, iPad or iPhone. In this game, you will set up your own little park, populate it with all manner of adorable creatures, raise them from hatchlings to adults, provide loving care, and produce even more exotic species through selective breeding. Do a good job and not only will you bring a little more magic back to the world, but you might just make a handy profit as well! As much as you might want to begin raising your dragons from the get-go, you first have to provide a home for them. When you start out in DragonVale, you don’t have much; just a single floating island with no dragons or even a suitable habitat for them. It will be up to you to make sure your dragons’ living spaces are attractive and have everything they need to grow healthy and strong. Open up space on your island by clearing out obstacles like bushes, rocks and unwanted trees. Bigger obstacles require more money to destroy. Expand your park by acquiring more islands over time. Save up your money and buy up to ten different islands. Some islands have distinct properties that make them more suitable for different purposes. Use the Epic Breeding Island to increase your chances of breeding a special dragon or get the Gemstone Island to house the rare Gemstone Dragon. Set up different habitats to provide a livable home for the various species. Make a highly vegetative place for Plant Dragons, put up a volcanic lair for your Fire Dragons, create a frozen tundra for your Ice Dragons, and more. Construct buildings in your park to keep your dragons healthy and happy. Grow food for them with a Treat Farm. Dig a Breeding Cave where two dragons can get to know each other in private. Host competitive events by building a Coliseum and much more! Spruce your isles up with a variety of decorations. Raise flags, plant mushrooms, construct pillars, and more. The layout of your park is literally at your fingertips. Once your islands are set and ready to go, you can finally start your dragon-rearing career. It won’t be easy; dragons can be demanding little reptiles and they require a lot of love and care. Take care of your dragons and they’ll take care of you. Raise hundreds of different dragon species affiliated with various elements, including fire, water, air, lightning, ice, earth, vegetation and metal. Watch your dragons evolve over time. Monitor them as they start out as cute hatchlings, grow into awkward juveniles, and finally mature into strong adults. Feed your dragons with treats that you can buy from the market, harvest from farms you own, or win from competitions on the Dragon Track. The more you feed a dragon, the faster it will grow and level up. 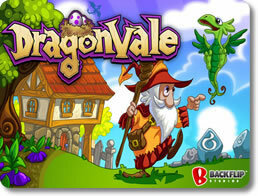 There’s more to DragonVale than just putting together a park. Your dragons need to exercise and challenge themselves. By purchasing the Dragon Track or the Coliseum, you can engage in a racing minigame that lets you see what physical feats your beasts can perform. Do well enough and you just might earn some valuable prizes. Pit your dragons in a race to the finish line against three opponents. Race on your choice of nine tracks, each of which contain different kinds of terrain. How well a dragon runs on certain land types will depend on what elements he is affiliated with. Give your dragon a boost of speed by tapping him before he hits every yellow line on the track. Time your taps perfectly for the best possible results. Spin the wheel after the match is done to determine what kind of prize you’ll walk away with. Not all dragons can be bought. There are many incredibly rare and exotic species out there that can only be acquired through careful selective breeding. Getting just one can be a difficult endeavor, but if you can imagine the kind of crowds it will draw, it will definitely be a worthy one. 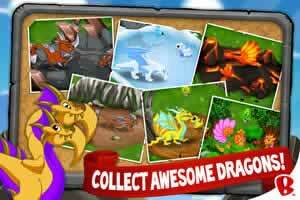 Breed dragons of different elements together to unlock new species with aspects of both! Breed an Earth Dragon with a Plant Dragon to get a Moss Tree Dragon, use a Lightning Dragon and a Water Dragon to get a Plasma Current Dragon, and more. Dragons of opposite elements just can’t be spliced. Breed hybrids together to acquire new dragons that can possess at least three elements at once! Breed one with four elements to get a super exotic Rainbow Dragon. Whatever species of dragon you get from any particular union is randomized; you never can tell what exactly you’re going to get. Breed special “limited” dragons that are only available for specific times of the year. You can get a Reindeer Dragon for the holidays, a Love Dragon for Valentines Day, a Firework Dragon for Independence Day, and much more! Do you like animals? Do you like dragons? Would you like to take them everywhere you go and see what amazing breeds you can create in a fantastic zoo designed by your hand? If so, then you cannot possibly go wrong with DragonVale.